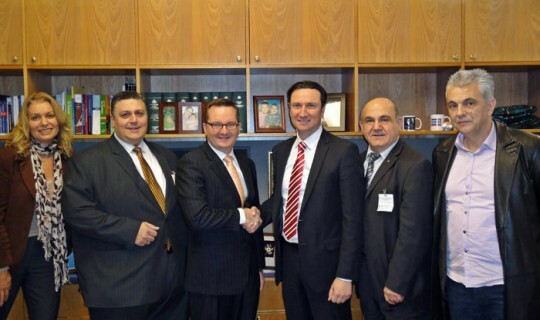 In a statement released today members of the Greek Orthodox Community of Melbourne & Victoria's Immigration Committee expressed their satisfaction with respect to their meeting with the Minister for Immigration and Citizenship Mr. Chris Bowen that was held at the Minister's office in Canberra on Wednesday 15th June. Specifically, the Minister discussed with the Committee at length the problems currently faced by Greek citizens who wish to migrate to Australia and the recommendations put forward by the Greek Community. The Minister viewed all recommendations in a positive light and agreed to investigate the matter further. During the discussion it was agreed that a bilateral agreement should be pursued in regard to working holiday visas between Australia and Greece. Currently over 20 countries have such agreements in place and priority will be given by the Ministry in endeavouring to sign a reciprocal agreement with the Greek Government. The Minister also agreed that the Department of Immigration and Citizenship should organise a Skill Expo in Greece which will involve representatives of the Department and employers. Such Skill Expos are currently held in many countries throughout the world; both the Minister and the Committee noted that it would be feasible to organise such an expo in Greece whereby Greek citizens who wish to migrate to Australia can seek information and find employment opportunities with participating companies. Furthermore it was agreed that the Australian Embassy's website will provide information in Greek as well as English. In regard to additional personnel for the Embassy the Minister informed the Committee that his Department will investigate whether there is a demand for more staff to be assigned to the post. As for spousal visas and the current delays that are occurring, the Minister assured the Committee that the Department would explore the issue in order to avoid unnecessary delays in the reunification of families. The Committee that met with the Minister consisted of Bill Papastergiadis (President of the Greek Community), Costas Markos (Hon General Secretary of the Greek Community), Mike Zarifopoulos (Board Chairman of Melbourne Community Television Consortium Ch 31 and President of Fronditha Care), Elizabeth Hagiefremidis (Principal Consultant, bwp Consulting) and Peter Jasonides (Chairperson of the Australian Hellenic Council). During the meeting the Committee presented to the Minister a copy of the GOCMV's Immigration Report which consists of information and data relating to the matter of immigration from Greece to Australia and a series of recommendations. The President of the GOCMV Bill Papastergiadis expressed his satisfaction with the meeting and the positive responses provided by Minister Bowen. "I am pleased with the discussions that took place and the Minister was informed of the issues at hand. The dialogue was not only positive but also had effective results with the Minister agreeing to act upon the recommendations put forward".